The Cliftondale Community Club is a non-political, civic organization formed to enrich and encourage development of the Cliftondale community through non-profit service. Serving the residents of Cliftondale Georgia, located in South Fulton County. The Cliftondale Community Club is a non-political, civic organization formed to enrich and encourage development of the Cliftondale community through non-profit service. The club was founded in 1952 as the Tell Section Civic Club. The name of the Tell Community was officially changed to Cliftondale in 1957, and the club’s name was changed accordingly. The Community Clubhouse used as our meeting place was actually built by Club members in the early years and later donated to Fulton County. Our mission statement is simple… “Be informed and be involved, and in doing so we can be proactive instead of reactive.” In recent years the Club has focused mainly on development, education, and public safety. Because of the Club’s seniority and extensive area , Fulton County recognizes us as the organization representing the Cliftondale Overlay District. Cliftondale residents can of course belong to both the Club and their homeowner associations. You are invited to attend our Cliftondale Community Club meetings held the 2nd Monday of every month at 7:00-8:00 p.m. at the Cliftondale Clubhouse, 4645 Butner Road (behind the tennis courts). Just complete the membership form & bring it to a monthly meeting with your payment. 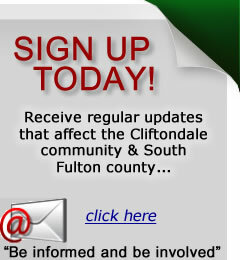 Get informed, get involved… If you are not currently on the Cliftondale email and/or mailing list please email us.